We will attend the coming 2013 Hong Kong International Lighting Fair(Autumn Edition) in Hong Kong Convention and Exhibition Center from October 27th – 30th, 2013, and our booth NO. is 5C-C15 & 5C-C17. It’s an exciting opportunity to see our latest catalogue and innovative new products. Via constant research and experiment in 2012, the company finally successfully developed the second optical design for LED (light-emitting diode) reflective cup in early 2013 with own patented technology, representing major improvements on existing reflective cups. The company now turns out the reflective cups of AR111, MR16 and GU10, featuring even light pattern, light weight, good quality, and high transparency, which have received warm reception from channel players. Some agents comment that the company’s AR111 reflective cup is the LED light on market most resembling halogen lamp. 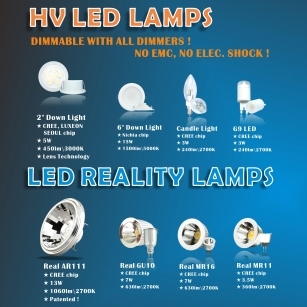 On the other hand, we’ll also demo several HV LED products including SPOT Light and RECESS Light, which use conductive plastic material from Japan as heat dissipative body.